Ezekiel 40-48 paints a vivid picture of a restored Jerusalem Temple, depicting the return of Yhwh’s kabod (glory), regulations for the Temple, and the division of land surrounding the temple and city. Ezekiel’s plan is not just of a temple building, but of a clear structure for the proper worship of Yhwh in the renewed community. These fragments (4Q73/4QEzek a, frgs. 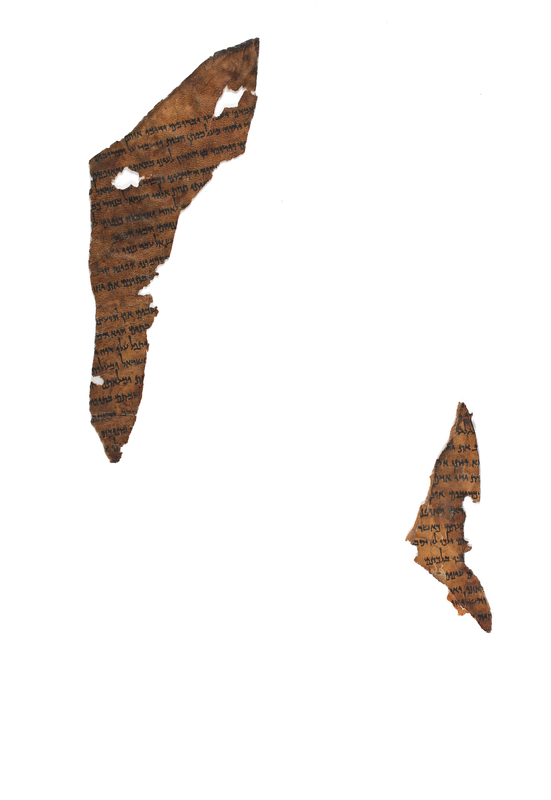 4-5), preserved among the scrolls at Qumran near the Dead Sea, preserve part of a copy of Ezekiel 41:3–6. The text tells of Yhwh’s triumphant arrival in the restored Jerusalem, the undoing of the disaster brought on when Yhwh left the Temple at the end of Ezekiel 11. The preservation of this text, possibly for a scroll of biblical excerpts, suggests that later Jewish communities valued the temple vision, whether or not they considered it a realistic expectation. Courtesy of The Leon Levy Dead Sea Scrolls Digital Library; Israel Antiquities Authority, photo: Shai Halevi.